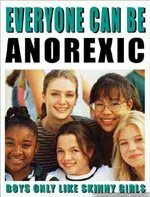 I was reviewing some pro-ana sites this morning. It’s not easy looking at and reading sites where young women talk about starving themselves to fit into some skeletal ideal woman they think they need to be in order to be happy. Here are some quotes from another of the sites. I edited out others, these were of interest to me. hi. we hang around the same drinking hall sort of speak…i see you all the time @ Useless Men…i just wanted to let you know that i absolutely love your answers. I’m starting to notice my looking for what you had to say this time…you are very funny…just wanted to let you know i really enjoy them…and btw, these quotes are great! Thanks. I’m moving (soon I hope) and things are a bit messy here. I don’t have my computer online and I haven’t been keeping caught up with the emails.